A Day Late and A Dollar Short: Crowd Cut - Mittie's Tea Room at plum and green - Three Different Options - Today Only! Crowd Cut - Mittie's Tea Room at plum and green - Three Different Options - Today Only! I know so many woman that love this tea room. On Crowd Cut today, they are having a great "sale" on tea parties. So why not get a group of girlfriends together and head down to Alpharetta and Mittie's Tea Room? 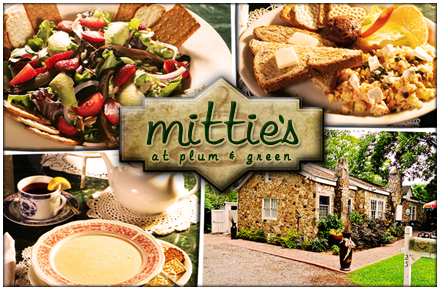 Ladies of lunch have enjoyed the charming atmosphere and delicious fare at Mittie's Tea Room for years. The ambiance, décor, patio and menu is sure to satisfy the southern belle in every one that walks through their humble doors. Mittie's caters to showers of all sorts, as well as birthday parties or any type of group gathering. This quaint tea room is well known for their delicious fare which includes a full breakfast and lunch menu. If this is your first time at Mittie's, it is almost protocol that you try the sultry and delicious lobster bisque. Tea rooms differ from café's in that they offer a more intimate atmosphere where you wont have to fuss with any type of line or loud atmosphere - leaving plenty of time for gossip. If you or your girlfriends are planning a shower or birthday party this upcoming year, take advantage of the amazing offers available through Crowd Cut and Mittie's Tea Room for up to 60% off. Purchase limit 1 of each deal option per person. May buy 2 additional as gifts. Limit 1 voucher per table & per visit. Reservations required with 7% tax and 18% gratuity taken at time of reservation to secure place. Dine-in only. Catering: 48 hour advance notice required 7% tax and 10% service payed upon placement of order in cash. Delivery available for minimal charge. Free delivery within 3 miles of Mittie's. Catered lunch includes all disposable tableware. Visit Crowd Cut to purchase. Hurry! Only a few hours left on this deal!